With World Champion Dean Ambrose teaming with Dolph Ziggler against The Wyatt Family and Alberto Del Rio taking on Randy Orton providing two marquee matches for Tuesday night, would the penultimate Smackdown Live before SummerSlam be affected by the absence of AJ Styles and John Cena? Opening and closing Smackdown Live this week, we had the on-going feud involving World Champion Dean Ambrose, Dolph Ziggler and Wyatt Family members, Bray Wyatt and Erick Rowan. The curtain up was arguably the strongest part of the show, starting with an intense promo from Wyatt covering Ziggler's victory over him on #885, as well as his desire to make Smackdown Live "his show". The Eater of World's looked like he believed everyone of his words and built the promo towards a crescendo, for Ambrose to interrupted him. The difference that are being show between The Lunatic Fringe and The Show-Off, like Ambrose being reluctant to fight Wyatt Family, whilst Ziggler rushed into the action, are what's keeping their feud interesting. The segment concluded with Wyatt standing tall after throwing Ambrose into a superkick from Ziggler, before finishing off the #1 Contender with Sister Abigail. Having Wyatt show intelligence to use the two World title rivals against each other in the scrap added an extra depth to their tag match that was later booked by Shane McMahon and Daniel Bryan. The tag match between the two was a simple tag bout, again used to showcase the relationship between Ziggler and Ambrose and the capabilities of Wyatt. Ambrose worked the lunatic in peril role, taking a prolonged beating from Wyatt and Rowan, but the best action of the contest actually came in a sequence between Ziggler and Big Red following the hot tag. The #1 Contender attempting to knock Rowan off his feet was a cool twist on two wrestling cliches and carried the contest towards it's finish well. Ziggler would pick up the pin on Rowan following a superkick, but the closing sequence was damaged by Ambrose slipping when hitting Wyatt with a suicide dive. A respectable main event, but nothing that's worth seeking out. Ambrose hitting Dirty Deeds on Ziggler following the bell felt a little tacked on, but I'll reserve judgement completely until next week's show and wait to see how the storyline plays out. Randy Orton's disqualification victory over Alberto Del Rio was the strongest match this week, but like the main event, hardly pulled up any trees. It was weird seeing ADR placed in such a high profile match, after the first two week's of the re-formatted Smackdown Live, have seen him exit a Battle Royal early and then not even feature on last week's outing. He did, however, put in a strong enough performance for him to be considered for a more prominent role on the show going forward. He produced a spirited and technically sound approach to the match, targeting Orton's arm and bringing a concentration to the contest that has been too few and far between since his WWE return last October. It was the first time he'd got to work a TV match with Orton in over three years, so perhaps getting to face a formerly familiar opponent, as well as the jump up the card motivated him to bring a little more to his game here. The finish felt a little out of place, as ADR took a chair to Orton's arm (which he'd sold terrifically all match) after being thrown into the time keeper's area, causing the DQ. Perhaps it was to show how much of a beating that The Viper can take and still manage to spring up for an RKO, ahead of his 21st August match with Brock Lesnar. However, considering how ADR has been presented on programming over the last month and half, with only four singles matches since June, with only one victory and losing to Cesaro and Darren Young, it felt odd for WWE to protect him from the pinfall victory, against an Orton who has a major match coming up on the companies second biggest show of 2016. Perhaps it was to set up a bigger No DQ bout between the two on next week's episode, which I'd look forward too, especially with the prospect of a much cleaner finish than this. In the lower half of the card, Alexa Bliss would take advantage of Eva Marie's distraction to upset Becky Lynch in a brief but well-worked debut. Bliss didn't have much time to make an impression on the new audience in the ring, but got her character over nicely in short promo when accepting Lynch's open challenge. The main storyline however, was Marie initially being unable to compete for the second week running, because the straps on her top came untied, which got one of the biggest pops on the show, because yanno breasts. I'm feeling like Marie's various excuses to not compete are going to become my favourite part of Tuesday nights, as it's only going to make portions of the audience hate her even more. It also means that when Marie finally ties it up with someone in the ring that the match will be a much bigger contest than it would have been last week or this week. Lynch presents a nice juxtaposition to Marie and extenuated this well with her promo issuing the open challenge. Also in the Women's division, Carmella got revenge on Natalya with another short but solid debut clash. Rabobank Arena seemed to quickly warm to The Princess of Staten Island and began to get behind her, as she battled against her rival, who has taken on the role of a cocky veteran bully. I feel like Natalya's performance had a lot to do with keeping the crowd warm, as she was constantly posturing, mouthing off to the fans whilst locking in wear down holds and putting on purposefully lackadaisical pins. Whilst it gives Carmella some huge momentum straight off the bat, I was disappointed to see her pick up a four minutes submission victory with the Code of Silence, as I was hoping that the contest would go for another five minutes or so and such a conclusive finish seems to put to bed any momentum that the feud itself could have picked up after just two weeks. Rounding off the most notable action, Rhyno picked up his first (non-NXT) WWE singles win since a victory over Simon Dean on Sunday Night Heat in February 2005, to deny Heath Slater a Smackdown Live contract. The Bakersfield crowd was pretty mild for another short encounter, which lacked urgency and any of the entertaining antics that Slater brings to his mic work. It's an odd storyline to expect an audience to get behind, Slater is working as a comedy heel trying to earn a job, are the crowd supposed to be against him being hired by anyone and cheer for his opponent (a guy who has only just returned to WWE) to keep him out of the company? It was a strange decision to have Rhyno reveal that he'd already been given a contract in a backstage skit beforehand, as if both had been fighting for a contract then we might have had an interesting contest that the crowd could have got behind. American Alpha (Jason Jordan and Chad Gable) picked up a squash victory over California duo Mike Vega and Mikey O'Shea, before fending off The Vaudevillains (Aiden English & Simon Gotch), The Hype Bros (Mojo Rawley & Zack Ryder) and The Ascension (Konnor & Viktor). A preview for AJ Styles v John Cena at SummerSlam on 21st August aired. 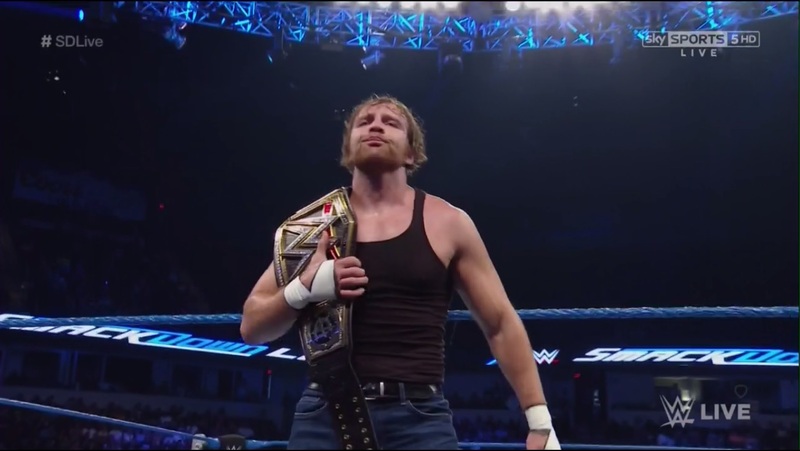 Watchable is probably the word I'd use to describe this week's edition of Smackdown Live. The two top matches were both decent encounter, offering storyline development in the main event and solid action in the Orton v ADR match (which admittedly seemed to be just treading water for Orton before SummerSlam). In mid-card was entertaining again for the most part, expanding a couple of storylines (especially in the women's division) but not giving enough time or space for the action to develop into anything significant. Putting on match on Smackdown and the other on Main Event would have allowed for them both to be much more satisfying encounters. With just one more episode til SummerSlam, I'd be expecting next week's go-home edition to have a lot more to offer.